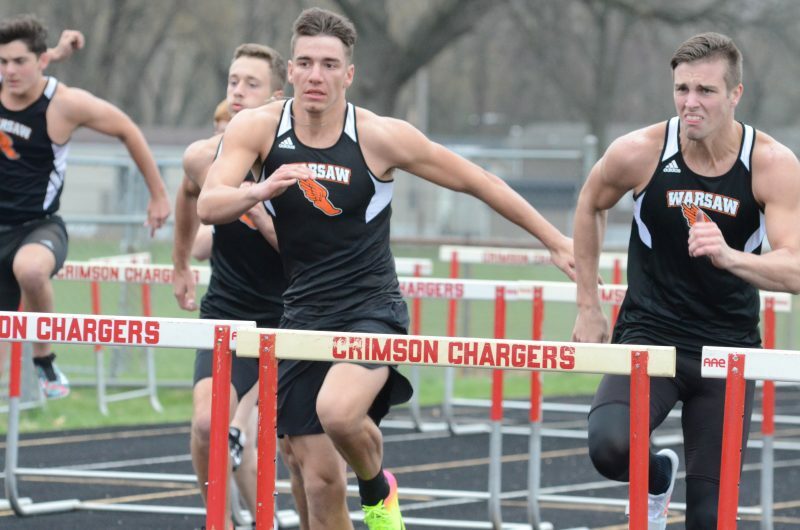 Kendal Miller (at left) won both hurdles races for Warsaw in action at Elkhart Memorial Thursday night. ELKHART – There are very few sure things in life. Come April though there are at least a couple of things that you can count on. And the Warsaw boys track team winning Northern Lakes Conference meets. The Tigers continued their league dominance in a big way Thursday night by opening the 2017 NLC season with a 108.5-23.5 victory over host Elkhart Memorial. Warsaw, which was competing for the first time since a 76-56 loss at Penn in the season opener way back on March 27, was dominant. The Tigers won 13 events on the chilly evening, including sweeping four events. Warsaw, under the direction of coach Matt Thacker, has now won 42 NLC meets in a row dating back to the 2011 season. The Tigers have also won six straight NLC Meet championships. 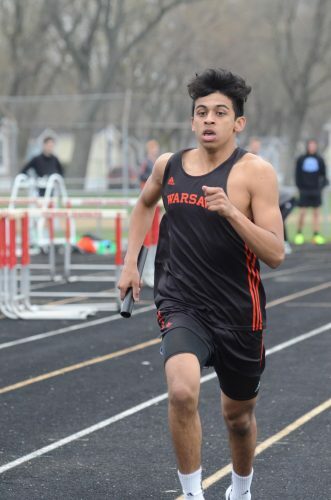 Xavi Ramierez runs the anchor leg on the winning 4 X 800 relay team. Kendal Miller led the way on the track for Warsaw Thursday night. The senior was a double winner, taking the 110-meter hurdles in a time of 16.37 and also winning the 300 hurdles in 43.73. The Tigers won two of the three relay races on the evening. The team of Xavi Ramierez, Kennis Dye, Taylor Mills and Justin Fleming opened the meet with a winning performance in the 4 X 800 relay in a top time of 8:34.62. Warsaw won the 4 X 100 relay as Rane Kilburn, Will McGarvey, Alijah Wade and Tristan Larsh took first in 45.53. Wade also captured first in the 200 in 23.07 and Fleming won the 800 in 2:07.86. 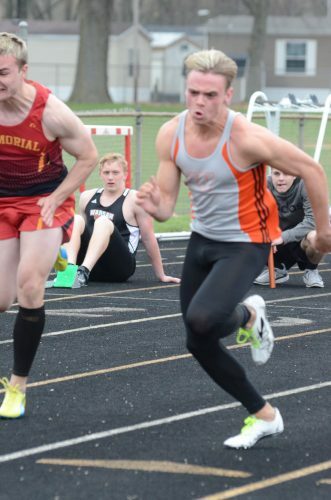 Lucas Howett took the 3,200 in a time of 10:16.30 for the Tigers and D’Andre Street won the 400 in 54.44. 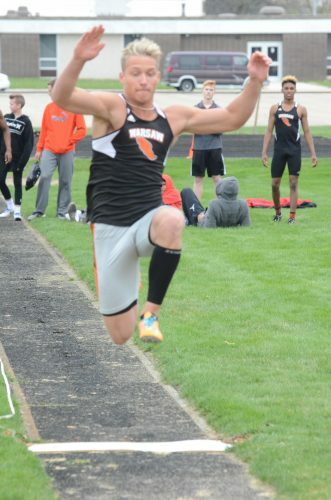 Warsaw also had a strong night in the field events with wins in all five events. Kilburn went 19-10.75 to claim first in the long jump. Eli Owen cleared a top height of 5-3 to win the high jump and John Svinarich won the discus with a throw of 141-8.5. Hunter Metzger won the pole vault with a winning height of 10-6 for the Tigers. Dalton Smoker claimed the shot put with a throw of 47-10. Warsaw will compete in a pair of events on Friday night, one at Lafayette Jefferson and another at Franklin Central. The Tigers return to NLC action on Tuesday at Northridge for a league triangular with the host Raiders and Wawasee. Tristan Larsh competes in the long jump. Rane Kilburn competes in the 100.